The Pokémon announcement everyone has been waiting for finally arrived. Unfortunately, for American fans it arrived in the wee hours of the night, but the news was so worth it! If you have your google alerts set for anything Pokémon related, then this trailer may not have been much of a surprise! Various sources have leaked a number of rumors, that to our surprise, were quite accurate. From the name of the games, to the ability to incorporate our Pokémon Go apps, we have been waiting for conformation from Nintendo that these rumors were in fact real. Ask and you shall receive! We are not only getting these two 'Let's Go' games, but also the new game 'Pokémon Quest', and a core RPG game in the later half of 2019, according to the Pokémon 2018 Video Game Press Conference held in Tokyo, on March 29th, 2018. To honor this wonderful announcement, we have presented 5 features for these new games “Pokémon: Let’s Go Pikachu!” and “Pokémon: Let’s Go Eevee!” that we are extremely excited for! Hold on to your Pokéballs! On September 12, 1998, a little game called 'ポケットモンスターピカチュウ' hit the Japanese market. Before you run to paste that phrase into google translate, it means 'Pocket Monsters Pikachu', which was some what of a sequel released on the Nintendo Gameboy after the success of Pokemon Red and Blue (Red and Green in Japan). On October 19, 1999 it was brought to North America and was know as 'Pokemon Yellow'. Very fitting, the game featured a gifted little electric mouse known as Pikachu as your starter, much like the main character 'Ash' from the Pokémon anime series. Now, nearly 20 years later, we are getting a reimagined version of the game for Nintendo Switch. We hope the wait will be worth it! From the 4 color, pea-green Gameboy screen, to the 720p Nintendo Switch handheld screen will be the upgrade we have been wanting for years. Making the move from sprites to 3D rendered graphics seems like a move that should have been made years ago, but now that it's here, the Switch is the perfect device for the task at hand. No more are the days were we shuffle through endless encounters from pidgey and rattata! In this new iteration of the franchise, we can look forward to actually SEEING which Pokémon we are about to battle. The 6th generation (Pokémon X & Y) attempted to give us more insight on where Pokémon were hiding with the PokéRadar, then 7th generation (Pokémon Sun and Moon) graced us with warnings like tails in tall grass, and shadows form above encounters. Yet, this is really what some players have been asking for, actually seeing which Pokémon are wondering around and making the decision to battle... or not! Along with wild Pokémon walking about, your party members will possess the same privilege! As I stated previously, this game is considered a 'Pokémon Yellow' remake in the Kanto region. In that particular game, when you are given the Pikachu as a starter, he refused to live in his Pokéball. Thus, birthing the walk along Pokémon mechanic. This was also used in the remake of the second generation remakes 'SoulSilver' and 'HeartGold', which let the first member of your party follow behind you. In this game, it looks as though we will have this same mechanic, as well as incorporating the 'petting' mechanic from the last generation. 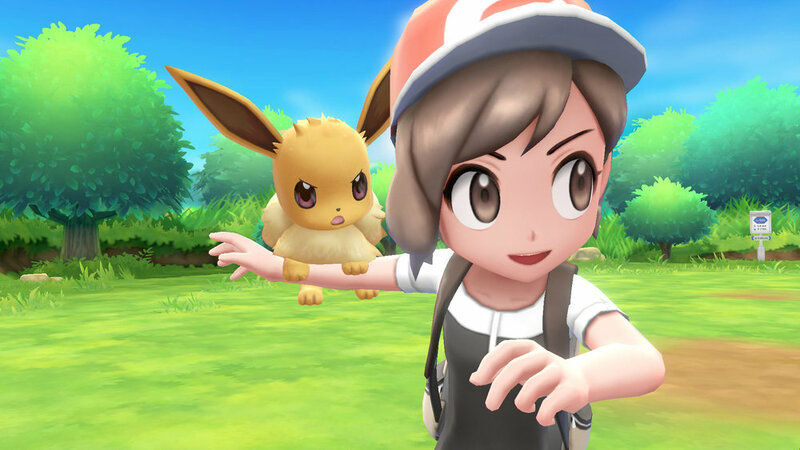 Lucky for us, we will have Pikachu or Eevee riding on our characters shoulders as well as a walk along. Are you excited yet? 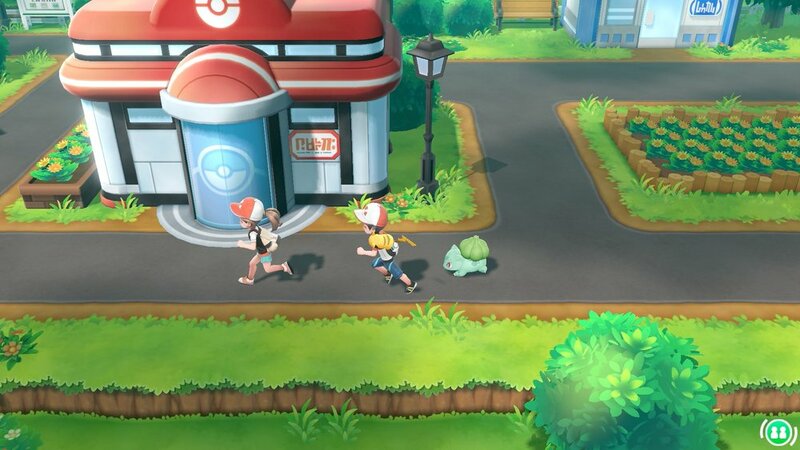 Since this is officially the first core Pokémon game to come to a 'console', it is the first time we are given the opportunity to have multiplayer functionality. In these new games, Game Freak is taking advantage of the Switch's tabletop mode, allowing a second player to pop in and out of the game, and assist in battling, as well as catching Pokémon. This opens the door for families who have one switch, but multiple players. Long gone are the days where you have to pass the Gameboy or DS to a friend or sibling, you can play at the same time! Last but not least, we need to talk about this Pokéball, that looks like the PokéWalker's older, hotter sister. I would have given my left kidney to have something like this when I was a young lad playing Pokémon in the school yard during recess. Let's break down what we saw in the trailer, shall we? It seems as though this Pokéball can be used as a remote to play the game, as well as a device to take with you when you aren't playing. The button on the ball appears to be a joystick that you can use to play the game, since it was stated in the press conference that the game can be played with one Joy-con. Unlike it's predecessor, the PokéWalker, it seems as though this accessory will have more functionality and hopefully be useful during game play. In the trailer, we saw that the ball lights up and makes signature Pokémon sounds when you catch the little critters in the game. Personally, I think this is a great gimmick to make the game more attractive to the new generations of players. I look forward to examining this great add-on come November. Check out the official trailer from the Pokémon Company here!